House, 6 Bedrooms, 5 Baths, (Sleeps 12-14) Excellent onsite cook included. Villa Paraiso is an exclusive luxury Villa with a spectacular view of the Pacific Ocean, where comfort, privacy and excellent service will make your stay an unforgettable experience. It is a place especially designed for the comfort and tranquility of its guests. Villa Paraíso es un exclusivo resort de lujo con una espectacular vista al Oceano Pacifico, donde el confort, la privacidad y el excelente servicio harán que su estancia sea una experiencia inolvidable, cualquiera que sea el motivo de su visita. Es un lugar especialmente diseñado para la comodidad y tranquilidad de sus huéspedes. The base price includes 4 guests using 2 bedrooms (double occupancy). Additional guest fee is charged for each guest above the initial 4 (assumes double occupancy of bedrooms). If you require separate bedrooms for guests, inform us and we will adjust the price accordingly. The villa is surrounded by lush vegetation, with a magnificent view of the Pacific Ocean. Enjoy the soothing sound of the waves. Spectacular sunsets can be enjoyed from all the terraces. The villa has 3 terraces, all with views of the ocean and comfortable sofas and chairs. The lower terrace has a jacuzzi for 6 and a palapa with comfortable seating. The sunny middle terrace has a pool and a large patio area with lots of lounge chairs and a bar. The upper terrace is shaded and furnished with couches and love seats. First on the list of the many amenities is the cook, Anita, who prepares wonderful meals of the local seafood, Mexican cuisine, or American favorites. Emilio, Anita's husband, buys your seafood, meats and vegetables fresh every day and is available to do your other errands. The rooms are cleaned daily by a maid. You have access to a private beach, that only the guests of Villa Paraiso have access to. It is a 10 minute walk down to the beach. It is more difficult to return, 15 minutes all uphill. You will have stereo sound on all levels of the villa, bring your iPod and plug it in. The wifi reaches all areas of the villa and we have Sky satellite television service in three of the bedrooms. All of the bedrooms have air conditioning and ceiling fans. When I am in residence I will go pick you up and take you back to the airport as well as drive you around or arrange transportation at local rates. Also I will make sure your stay is as enjoyable as possible. I am multilingual and have been enjoying Acapulco since my teen years. I am confident you will greatly enjoy your stay and come back, like many do. This is the area of Acapulco that was first developed and is built in Classic Acapulco Architecture. The compound on which the property is located has three villas; one of which was Johnny Weissmuller's, the original Tarzan. The homes are built on a hillside overlooking the Pacific with a perfect sunset view. It is built in the traditional Acapulco Luxury Style with three terraces overlooking the ocean, beautiful tile, marble and granite floors and walls. It is close to Pie de la Cuesta where I love to waterski and enjoy other waterspouts. I have my own beach and I'm within a few miles of the beach in Acapulco Bay or the one at Pie de la Questa. Also I'm located just a few miles away from all the hotels, restaurants and nightlife of Acapulco. Overlooks the Pacific and a bird sanctuary. All the views beach and ocean views that you see in the pictures are taken from our terraces. Not only do you see the ocean, you hear the soothing sound of the waves. The Villa overlooks the Pacific with a view of Playa Mimosa. The walk down to the beach takes 10 minutes. The return trip is uphill and is more difficult and takes 15 minutes if you stop to rest. Wonderful view of the Pacific Ocean. We often see whales as they migrate between the Antarctic and the northern Mexico coast. Meals are prepared twice a day, request what you want and it will be bought and prepared fresh each day. 4 televisions connected to Sky TV. Only 2 converter boxes. There are 3 patios, one on each level, two are covered. Heated pool is not necessary. LA ZONA ES HORRIBLE CON CASAS DERRUIDAS COMO COLINDANTES, LLEGANDO SE ABREN 3 CANDADOS DE ACCESO PARA UN CAMINO IGUAL DE DERRUIDO A LA CASA CONTROLADA POR DOS PERSONAS QUE PRESENTAN COMO ANFITRIONES Y SE CONSTITUYEN TODO EL TIEMPO EN VIGILANTES DEJANDO SIN PRIVACIDAD LA ESTANCIA, ADICIONALMENTE SOLICITAN DE ENTRADA LA TARJETA DE PAGO PARA FOTOGRAFIARLA POR AMBOS LADOS; TIENEN UN "REGLAMENTO" EXTRA A LO OFRECIDO QUE SOLICITA MÁS DINERO COMO DEPÓSITO YA QUE AL ANUNCIARSE COMO AMIGOS DE LAS MASCOTAS Y ACEPTARLAS EN SU CASA PIDEN MIL PESOS POR CADA UNA Y LAS VIGILAN TODO EL TIEMPO PARA AL FINAL PONER EVIDENCIA FALSA Y NO DEVOLVER EL DEPÓSITO, ES LÓGICO PENSAR QUE UNO LIMPIA LOS DESECHOS DE MASCOTAS QUERIDAS Y ADUCEN QUE NO CUANDO UNO YA ESTÁ EN SU CIUDAD. ASÍ OFRECEN QUE LOS "VIGILANTES DE LA CASA" HARÁN LAS COMPRAS CON CUENTAS CLARAS DE LAS QUE NO TUVIMOS COMPROBANTES EN 90%; UTILIZAN UNA COCINA QUE ESTA INFESTADA DE HORMIGAS TODO EL TIEMPO CON UTENSILIOS VIEJOS Y SUCIOS COMO UNA LICUADORA LLENA DE COCHAMBRE EJEMPLO. ASÍ QUERIENDO METERSE A LA ALBERCA DESCUBRIMOS QUE ES DE AGUA FRÍA Y NO CUENTA CON EQUIPO DE CALEFACCIÓN O NO LO QUISIERON ENCENDER Y CLARO NO SE DISFRUTA. ASÍ QUE EL MAR ERA LA OPCIÓN UNA PLAYA QUE MENCIONAN COMO PRIVADA Y DE MAR ABIERTO, Y PARA LLEGAR A ÉL NUEVAMENTE SE ATRAVIESA UNA PUERTA CON CANDADO PARA LLEGAR A UNA CUESTA DE AL MENOS 30 GRADOS DE CAMINO DESLAVADO, PEDREGOSO, CON HOYOS CUBIERTOS POR HIERBA, MALEZA QUE CHOCA EN EL ROSTRO, PASANDO POR CONSTRUCCIONES DERRUIDAS Y ABANDONADAS Y DOS ALBERCAS LLENAS DE AGUA ESTANCADA Y PUTREFACTA ADEMÁS DE BASURA AL IGUAL QUE EN LA PLAYA OCUPADA POR LOS LUGAREÑOS.EL REGRESO ES PEOR DE SUBIDA PARA LLEGAR A UNA REGADERITA OXIDADA Y CON POCA AGUA PARA ENJUAGARSE. EL TALENTO EN LA COCINA SE CIRCUNSCRIBE A HUEVOS POR LA MAÑANA Y FRUTA CORTADA CON JUGO, UN GUISO COMO PESCADO O CAMARONES FUE DESASTROSO, COCINADOS EN UNA COCINA CON OLORES A SUCIO Y VIEJO. EL MOBILIARIO COMO LOS COLCHONES EN LAS HABITACIONES ES IGUAL DE VIEJO, IGUAL LA ROPA DE CAMA Y MOBILIARIO. POR SUPUESTO DE TODO ESTO MENCIONADO TOMÉ FOTOGRAFÍAS MUY MOLESTO ADEMÁS PORQUE SU ALQUILER LO COBRAN POR PERSONA Y YO RESERVÉ PARA 8 Y FINALMENTE FUIMOS 4, DE MODO QUE DEBERÍAN REEMBOLSARME EL IMPORTE DE 4 Y MI DEPÓSITO DE 3 MIL PESOS POR MIS PERRITOS (RECIBO QUE ME ENVIARON PORQUE LO HICE EN EFECTIVO Y SORPRENDIDO POR LOS ANFITRIONES),LES AGRADECERÉ INTERVENGAN PARA QUE SE CUMPLA LO CORRECTO Y EVITEN SORPRENDAN A MÁS PERSONAS. GRACIAS. Nos sorprendió mucho su llegada con 3 perros, de los cuales no tuvimos conocimiento con anterioridad. Como dice nuestra publicidad, si son pequeños y educados son bienvenidos, mas desgraciadamente ese no fue el caso con los suyos, pues hacian sus necesidades por doquier, asi como ensuciaron con pelos los muebles. También, como especifica la publicidad, solicitamos un deposito de mil pesos por mascota, el cual obviamente no se le regreso, razon por la cual pone tanto dato alternativo usted en su version. Su estadia fue durante año nuevo, la semana mas solicitada del año, y utilizaron 4 recamaras, una persona por cada habitación, razones por las cuales no procede devolucion alguna. Ademas, a pesar de que Anita es una excelente cocinera, como lo han dicho todos los huespedes, no recibio ni ella ni la recamarera y mozo propina alguna por una semana de su estadia. Tampoco la masajista. Esperamos que encuentre otro lugar que si sea de su agrado con sus 3 perros la proxima vez. What a fantastic time I had! What a fantastic time I had at Villa Paraiso! It was so wonderful and I look forward to going back many times! From the moment I arrived I was welcomed with smiles and hospitality and friendship. The views from the villa are outstanding and I still carry with me in my heart the lovely images and memories. I especially liked watching all of the birds coming and going around the point. I even saw a humming bird! The meals were delicious and served promptly despite the large number in our group. The villa is fantastic and I would have been happy to stay there all the days except that there was so much fun to be had in the area. I loved our day on the Lagoona, the cliff divers, and of course our sailing adventure. Next time I’ll be sure to see the markets! Villa Paraiso is fantastic and the special ingredient is the people! I enjoyed all of the guests and getting to know everyone, especially the two of you! There was something so magical in how we all got along as if we have been friends forever. I do hope to see you in Miami very soon so I can extend the same hospitality to you! It will be such fun. I had a wonderful stay. The view is incredible. Anita cooks delicious meals. The house is clean and well maintained. A great place to relax and unwind. Thanks for staying with us and we hope you return. A wonderful place to rest wit an amazing view. The place is amazing and you feel at home. The property is on a hill overlooking the Pacific Ocean and you can walk down to a private beach. There is WiFi, TV and all facilities to be connected to the world but at the same time enjoy privacy. Anita, the cook, prepares wonderful dishes of Mexican and international cuisine. This is my third visit to this property and each time I have enjoyed my stay beyond my expectations. The villa is located in a private location that offers everything you would want on a vacation--a pool, a hot tub, a beach, ample and comfortable clean bedrooms, and a view that is amazing with gorgeous sunsets every evening. The villa offers an exceptional staff. Anita and Emilio, the caretakers, treated us as if we were royalty! Anita cooked delicious meals at our request and both she and her husband Emilio were polite, courteous, caring and catered to our every whim. It was a pleasure dealing with Judith, the owner, as she was very accommodating and most helpful in assisting us with our arrangements. This was a fabulous vacation and I expect to be back again and again. Even though it was just my husband and I at this 6 bedroom villa, it was absolutely perfect. There are three levels to hang out on, and each one unique and beautiful in it's own way. 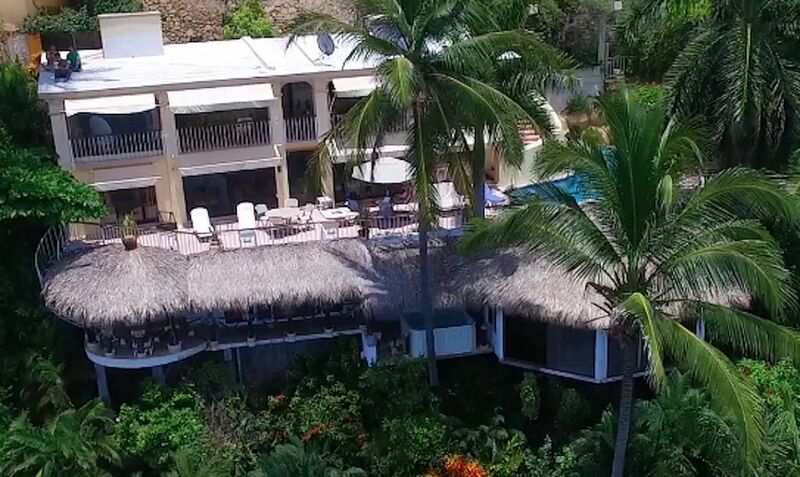 We seemed to use all of them equally, from the top terrace, to the pool, to the shady palapa - all providing spectacular views of the beach below, rugged and beautiful. The sound of crashing waves at all times was a real pleasure, as was the hospitality of all of our hosts. We were absolutely taken care of in every way, even though we struggled through our Spanish, our stay was a breeze and we enjoyed Anita's cooking every day. We came for the Abierto Mexicano de Tenis, a professional tennis tournament (which I highly recommend if you can score tickets! ), and even though it was a 45 minute drive, we were set up with a driver who was always on time and on call when we needed him. Acapulco is a beautiful city and made the drive fly by. We also spent time at Pie de la Cuesta, a gorgeous Sandy Beach with a nice surf and dotted with beach side restaurants. I can't stress enough how helpful Judith and Eduardo were in helping us plan our vacation - they really went above and beyond to make our stay amazing. We hope to return soon! Thanks for the great review, we are so happy that you enjoyed your stay. Please come back again. Whale Watching: If you are visiting during January February and March, watch for whales from the terraces. Bird Watching: Many colorful and interesting species can be seen from our terraces and garden. The peninsula in front of the villa is home to many more. Pie de la Cuesta has many species of waterfowl. See the information about the boat tours below. Massage: Another more relaxing suggestion is to take a fabulous, soothing massage at the Villa with Antoinette, cell: 744 169 4936. Tips: Tips are a significant portion of the income of the average Mexican. We don’t require that you tip the staff but we ask that you do. A hundred pesos per day per person in your group is a fair tip for the three staff workers, half of this amount will go to the cook and the rest to the maid and errand boy. Playa Mimosa, I have been visiting Acapulco and Pie de la Cuesta for over 30 years and love the area and my villa. Our villa overlooks our beach, Playa Mimosa, you can easily walk down to the beach. Walking back up is more difficult and only for the healthy. On calm days our beach is safe to swim but not when the surf is up. Acapulco Bay (5 km to the south)has miles of calm waters and sandy beaches. We go to one of the hotels and rent an umbrella for 50 pesos when we have guests with children who want to swim in the ocean. Pie de la Cuesta has a 10 kilometer long beach for walking and sun bathing but usually has high surf and is difficult and sometimes dangerous for swimming. I strongly suggest visiting “Pie de la Cuesta”, a resort area between the Pacific and a lagoon called Coyuca. We often go to Pie de la Cuesta for water skiing, boating, wildlife viewing, bird watching, surf sports, sun bathing and the restaurants and bars. Here you can rent a boat and go skiing. The water is warm and very calm. If you aren’t into water sports, you can rent the boat to take a tour of the lagoon. There are many types of wildlife to see and islands to visit. I recommend renting a boat at the ski club ‘Tres Marias’, ask for the boat driver Arturo, he can take you to the island Aldegundo where one can eat a delicious fish and shrimp cooked in the local style or just drink a ‘Nanches mezcal’ which originates from this area. We also like him to take us to the northernmost end of the lake. Here the barrier island is very narrow and at times water passes from the ocean to the lagoon. On the Pacific side of Pie de la Cuesta, a little further along from ‘Tres Marias’, you will find a small hotel called “Vayma”. Here children can play in the pools and adults can have a drink, eat and watch the sunset. This island offers a popular (crowded) beach, and snorkeling and diving possibilities. You can rent snorkeling gear, kayaks and more. From Playa Caleta, boats make the eight-minute trip (M$60 return) regularly. Alternatively, glass-bottomed boats (by the company Yates Fondo Cristal) make a circuitous trip (M$90) from here or the zócalo , pointing out celebrity dwellings, sea life and the Virgen de los Mares , a submerged bronze Virgin statue. Visibility varies. The trip takes about 45 minutes, depending on how many times floating vendors approach your boat. The Fort of San Diego (Spanish: Fuerte de San Diego), formerly also known as the Fort of San Carlos is a star fort in Acapulco, Guerrero, Mexico. It was built by the Spanish Empire, and it was one of the most important Spanish fortifications along the Pacific coast. The fort was first built in the 17th century, but was completely rebuilt in the 18th century. Today, it is an important landmark in Acapulco, and it is open to the public as the Acapulco Historic Museum. La Quebrada, Acapulco, is the site of the famous cliff divers performance. Since 1934 this has been one of Mexico’s feature attractions. The divers leap from cliffs 136 feet above the crashing Pacific, landing in an 11 feet deep inlet. There are five performances daily, including four evening shows, performed with divers carrying torches – an unforgettable spectacle. Best viewing is from La Perla Nightclub at the Cliffside El Mirador Acapulco (a cover charge applies). Deep Sea Fishing: For two or three fishermen, I have an experienced captain that I can recommend. For larger groups, I ask him to recommend a boat and captain. Smoking is allowed on the patios and terraces, not in bedrooms. Pets are allowed with an additional deposit. The cook prepares breakfast and lunch. She only works to 6:00 in the evening. Lunch in Mexico is the main meal and is served around 2 in the afternoon. If you would like an evening snack that you can reheat, please make arrangements with Anita the cook.